Conservation International -- this is the home page for Conservation International who works to preserve global diversity and insure the harmonious living of humans and the rest of the earth's life. See the perpetual capybara machine! 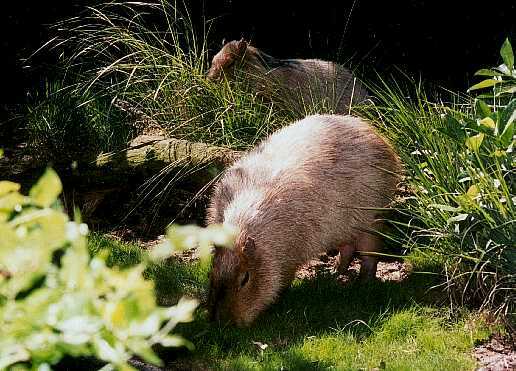 The name Hydrochaeris literally means "water pig"
Physical Characteristics: Capybaras are the largest rodents in the world and are semi-aquatic. They grow to be 3-4 feet long and can weigh 60-170 pounds. They stand about 1.5 feet high. Capybaras have no tail and short legs with webbed feet. Their front feet have 4 toes each and the back feet have 3 toes. Their fur is semi-long and coarse with color ranging from brown, gray, yellow and black. They have an approximate lifespan of 10 years in the wild and up to 12 years in captivity. Lifestyle: Their natural habitat is swamps, marshes, and forests in Central and South America; including the Amazon rainforest, Panama, Columbia, Uruguay, and Argentina. They are herbivores with a diet consisting of water plants, grains, fruits, and grasses. Like other rodents they need to gnaw and chew in order to wear their two front teeth down, which grow through out their lives. Behavior: They are active during the morning and night, and rest during the day in burrows. Capybaras are social animals gathering in groups of around 20 individuals. They communicate using whistles, barks, grunts, squeaks and clicks. They also have a sent producing gland in their neck that is thought to be used for marking territory and identification. Predators: The Capybaras predators are the puma, jaguar, caiman, ocelot, harpy eagle, anaconda and people. When threatened they scurry to the water and submerge themselves with only their eyes and nose exposed (see picture to upper left). Sexual Reproduction: The capybara reaches sexual maturity between 15 and 18 months. Their breading season peaks in April and May, and they have a gestation period of 149-156 days. They give birth to one litter a year with up to 8 babies per litter and an average of 4. Newborn capybaras weigh around 2 pounds and is already equipped with hair and sight. 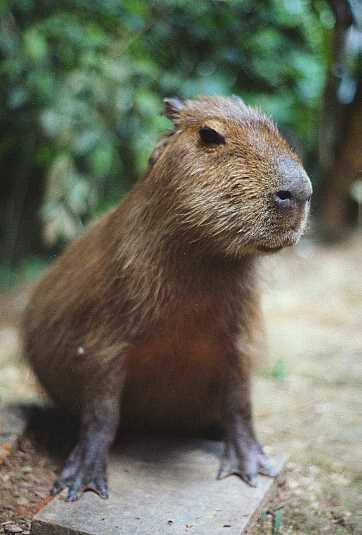 The biggest threat to the capybara is the loss of it's rainforest habitat. Because of logging, farming and the clear-cutting/burning techniques that are being used, their habitat is being diminished every day. 33.8 million acres of rainforest are lost each year, 2.8 million acres a month, 93,000 acres a day, 3,800 acres an hour and 64 acres a minute. Brazil alone lost 91.4 million acres fo tropical rainforest between 1980 and 1990. Because around 50 percent of the earths species live in tropical rainforests, this massive loss of their habitat causes the extinction of aproximatly 100 species a day. Luckily for the Capybara and other tropical rainforest dwellers the country of Suriname, with the help of Conservation International and other conservation groups, has created one of the largest nature reserves in the world on the Atlantic coast of South America. It's area is 1.592 million hectares. The habitat of the capybara is protected in the reserve, which is mostly tropical rainforest. 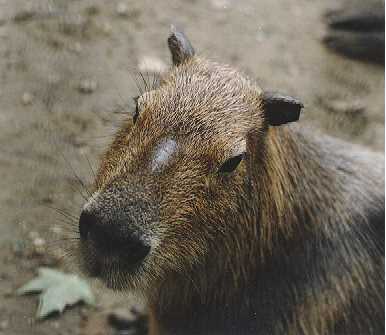 The capybara is also common in North American zoos which ensures it survival even if it is not in its natural habitat. Animals of the Rainforest / Ron Kalasinskas. Copyright 1999-2001. Capybara. http://www.animalsoftherainforest.com/capybara.htm. Accessed November 12, 2001. Brandywine Zoo. Date Unknown. Capybara (Hydrochaeris hydrochaeris). 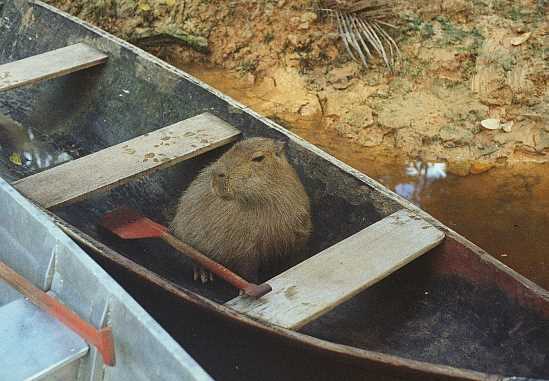 http://www.k12.de.us/warner/capybara.htm. Accessed November 12, 2001. Conservation International. Copyright 2001. 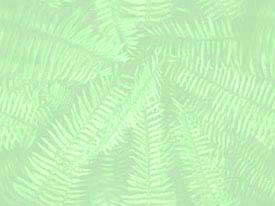 Conservation International home pagehttp://www.conservation.org/xp/CIWEB/home. Accessed November 12, 2001. Enchanted Learning. Copyright 2000-2001. Capybara printout. 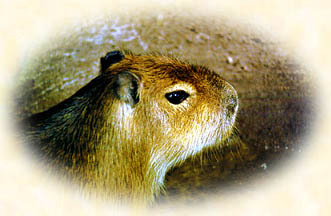 http://www.enchantedlearning.com/subjects/mammals/rodent/Capybaraprintout.shtml. Accessed November 12, 2001. InfoNatura. Copyright 2001. InfoNatura - birds and mammals of Latin America. http://www.infonatura.org/. Accessed November 12, 2001.
International Union for Conservation of Nature and Natural Resources. Copyright 2000. http://www.redlist.org. Accessed November 12, 2001. Nature Conservation. Date unknown. Nature conservation. http://www1.sr.net/~t100956/nature.htm. Accessed November 12, 2001. Sedgwick County Zoo. June 28, 2001. Capybara - Hydrochaeris hydrochaeris. http://www.scz.org/animals/c/cpybara.html. Accessed November 12, 2001. The Capybara Page. Date unknown. 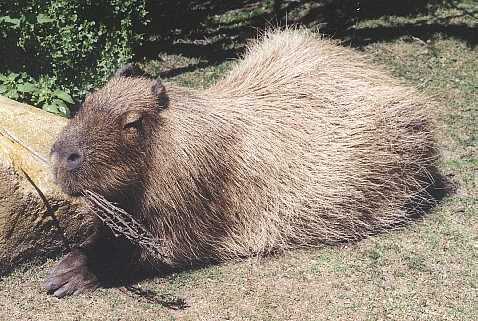 The capybara page: home of the world's largest rodent. http://www.rebsig.com/capybara/. Accessed November 12, 2001. The Rainforest Alliance. Copyright 2001. The rainforest alliance home pagehttp://www.rainforest-alliance.org/ . Accessed November 12, 2001. University of Michigan / Phil Myers. November 26, 1999. Hydrochaeridae family - capybara. http://animaldiversity.ummz.umich.edu/chordata/mammalia/rodentia/hydrochaeridae.html Accessed November 12, 2001. For questions or comments, email Lucy (martilu@earlham.edu) or Matt (rankima2@earlham.edu). This website is part of a Biology 26 class project on the conservation of global biodiversity.